The men’s soccer club has been active on campus for over ten years and currently has members from countries all over the world. 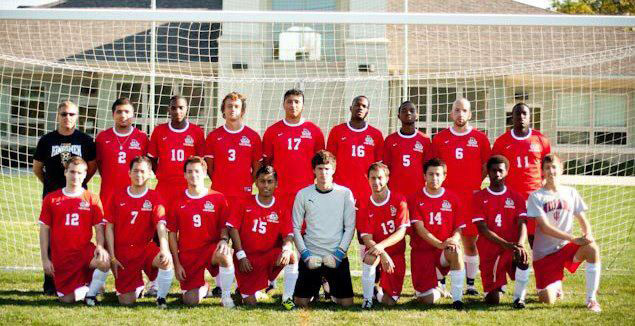 The IU South Bend Men’s Soccer Club has been active for ten years. Within the past few years they have improved the organization in terms of campus and community. There are currently over 30 members on the team. “Thirteen of our club members are from different countries including Kenya, Colombia, Mexico, Saudi Arabia, the Central African Republic, Ivory Coast, and Malawi to name a few,” said Ali Mahamat, club president. According to Mahamat, a few goals the soccer club would like to reach include developing a varsity program, participating in more community services around South Bend, create more of a “college experience” around campus and introduce different cultures to the community through their club. Since they have so many members from all over the world, they would like to spread this culture to those around South Bend. It is easy for students to do things with this club even if the students aren’t active members. Every Thursday night, as long as there isn’t a basketball game, students can catch the soccer team playing at 7 p.m. in the Student Activities Center. Mahamat said that new players are always welcome to join in and play or just hangout with the team. Competition has come from college teams all over the Midwest, such as Michigan, Michigan State and Purdue University. However, the soccer club has recently been playing more local teams such as Notre Dame, Goshen College and South Western Michigan. The cut back on traveling has reduced costs. This club is funded partially by IUSB, but most of the funding comes from dues and fundraisers. They try to keep costs at a minimum so that any student is capable of joining. Soccer can be played nearly anywhere. All students need is a ball and something to kick it between. Students interested in joining the Men’s Soccer Club can email iusbsoccerclub@gmail.com. Don’t worry ladies, there is a club for you as well. Students who would like to join the women’s soccer club can email Adriana Fernandez at adrifern@umail.iu.edu. Students can also search the club at www.myinvolvement.iusb.edu.